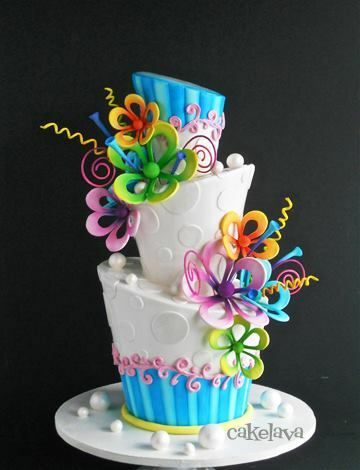 We each had to create a mani inspired by the cake pictured above but it was totally up to each of us how we did it. As you can see a lot of amazing and talented ladies took part and everyone has created such beautiful and unique designs! 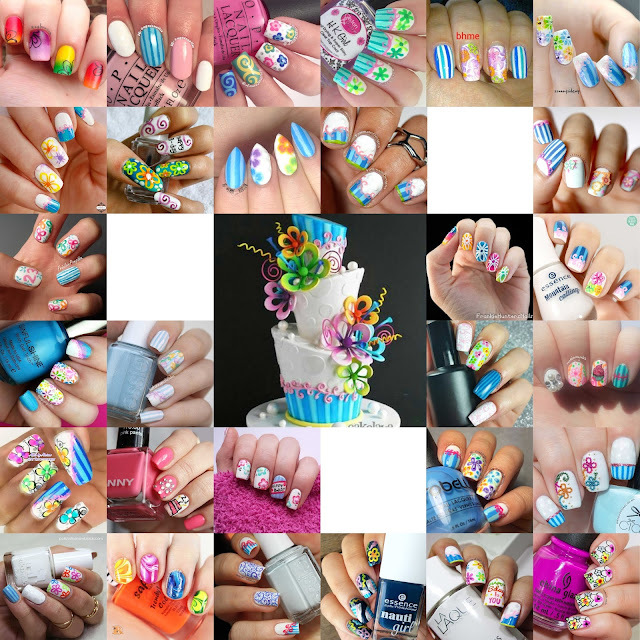 I tried to depict a few sections of the cake on my nails; the bright flowers and the polka dot/striped icing of the cake itself. I wish I'd managed to depict the flowers a little better since they look like a child's doodle but I kind of like them at the same time. Ella + Mila: Pure Love $10.50 or Love collection $80 (for 10 polishes) EllaMila. Ella + Mila: Beach Resort Blue $10.50 or Love collection $80 (for 10 polishes) EllaMila. Essie: Pearly White £7.99 Boots. OPI: No Room for the Blues £8.95 Nailpolishdirect. Dotting tools £1 (set of 5) Ebay. Straight Nail Vinyls £3.82 (for 200) NailVinyls. Winstonia Kolinsky Sable brush #0000 $6.95 Winstonia. Oumaxi Acrylic Paint £12.99 (for 30) Amazon. I painted the flowers freehand using acrylic paint and the #0000 kolinsky brush. This was my first time using the brush and I really liked it. It isnt as fine as some of my other brushes but it was a good size for this nail art. The polka dots were created using various sized dotting tools. For the Large dots I actually drew a bigger circle with them as I didn't have a tool big enough. Stripes were created using the straight nail vinyls. Happy Birthday Sabrina! Hope you are having an absolutely amazing day! Thank you so much for asking me to contribute to this amazing collab!